Want to earn in the Market? Ability to select which trades should be monitored via magic number. You can leave the value to 0 to only monitor manual trades or to any one magic number for trades opened by another expert advisor. Trailing stop option is also included. You can enable or disable the trailing stop option. 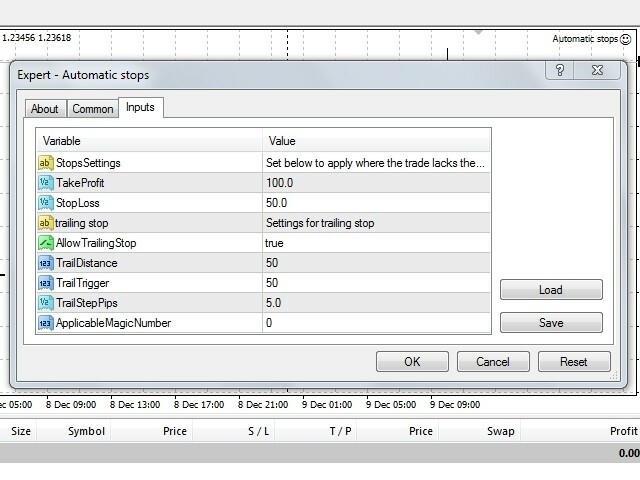 Input for stop loss and take profit value in pips by the user is included. If the value for stop loss or take profit is set to 0, then that parameter won't be monitored on trades. I acquired this AE on December 13, 2016. On the 15th I tested in USDJPY and forgot connected to the theft and lost 98% of my position. It was my first experience and I will no longer use trading theft. Be very careful with AE. I like it! I will use it! Now supports pending orders too! Inputs are now in points. Performance improved.